Saturday’s matches in the Premier League begin with a major derby (Tottenham v Arsenal at lunchtime) and end with a major derby (Everton v Liverpool at tea-time). Both home sides have found it tough against the neighbours over the course of the Premier League era as a whole. And they have uncannily similar records against their local rivals. 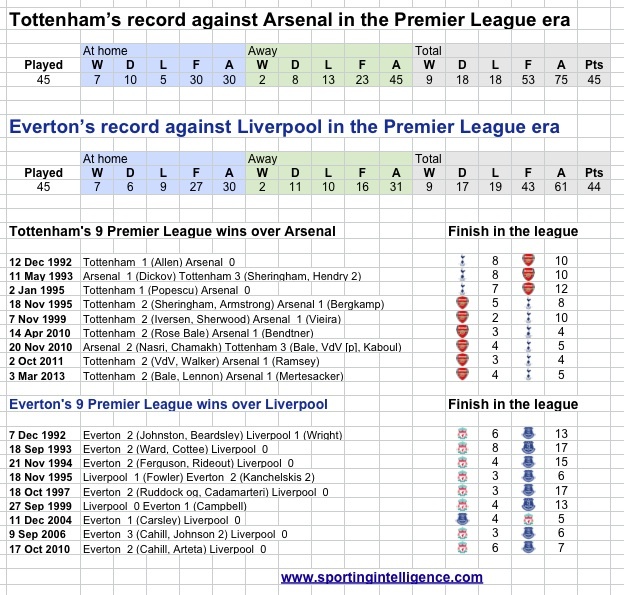 Tottenham have most often finished below Arsenal, but not always; Everton have most often finished below Liverpool, but not always. Tottenham trail Arsenal by 40-something points to 70-something points (45-72) in PL games; Everton trail Liverpool by 40-something points to 70-something points (44-74) in PL games. Tottenham claim just a 20 per cent win rate against Arsenal in the PL era. Everton claim just a 20 per cent win rate against Liverpool in the PL era. Tottenham have won seven of their nine PL victories over Arsenal at home and two away. Everton have won seven of their nine PL victories over Liverpool at home and two away. The last time Tottenham played Arsenal in the league it was 1-1. The last time Everton played Liverpool in the league it was 1-1. The graphic below summarises the similarities. One difference is Everton fans have been longer for a win over Liverpool than Spurs fans have over Arsenal; more than four years and counting. And those Everton fans might worringly note not a single one of their wins over Liverpool in the PL era has taken place after Christmas. 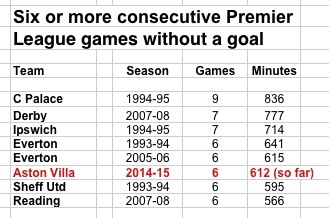 Aston Villa have become only the eighth in the Premier League era to go six full consecutive games without scoring. They last scored a league goal on the Saturday before Christmas in the 1-1 draw at home to Man Utd when Benteke gave them the lead after 18 minutes. Since then six games and 612 minutes have elapsed without them finding the back of the net. Of the other sides to do this Sheffield United, Everton sides twice and Reading scored in the 7th game. Villa fans will hope that happens when Chelsea visit Villa Park this weekend. Ipswich and Derby scored at their 8th attempts and Crystal Palace in 1994-95 had to wait until their tenth game. That Palace goal famine went from the 87th minute of a 3-0 victory over Ipswich with John Salako scoring on 5th November 1994 until 14th January 1995 when Ricky Newman scored after 23 minutes of a 2-0 win over Leicester, after 836 goalless minutes. Villa fans may or may not be encouraged by the fact that Everton survived their goalless runs and kept their Premier League status but the other five sides were all relegated at the season’s end.